Thirty-two Upward Scholars students were honored at the 2018 Cañada College, up from 15 graduates a year ago. Many of those students walked in Canada's graduation ceremony on May 26th. 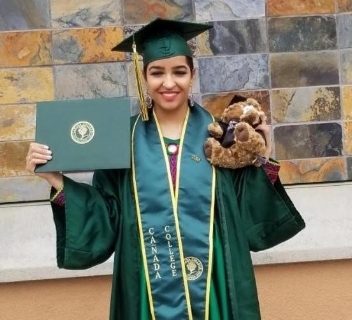 One of the graduates, Pakiza O, received an associate degree and, in the fall, will attend the University of California, Santa Cruz, majoring in philosophy. A native of Afghanistan, Pakiza came to the United States in 2013. Pakiza attended elementary and middle school in Kandahar where, she says, "her life was in danger every day." Upward Scholars provided Pakiza with a laptop, funds for books, and a bus pass prior to her purchasing a car last year. Other Upward Scholars students received academic certificates in early childhood education, human services, medical assisting, and office assisting. In addition, several students received Preparation for Academic Scholarship and Success (PASS) awards, meaning that they have completed all of their ESL classes as well three transfer-level classes, one in English and two in computer applications.